Howdy! 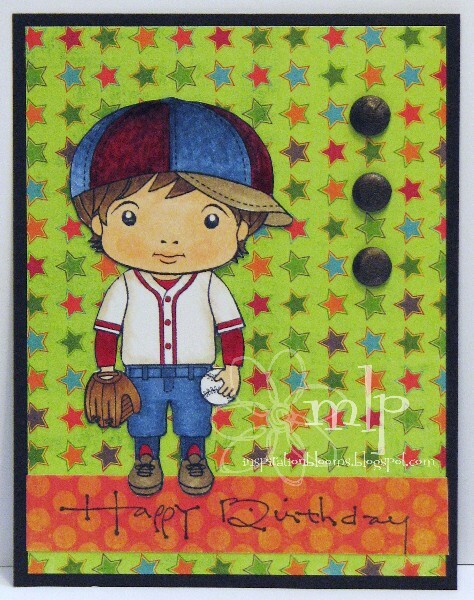 Michelle here with a birthday card for a little baseball buff! I went with a sweet LaLa Land image called Baseball Luca. If you are a LaLa Land buff...there are 70 images available in the store and this one is ON SALE!! I colored my little man with the following Copic Markers: E44, E43, E42, E59, E57, E55, E37, E35, E21, E02, E00, B99, B97, B95, R89, R59, R29, 0 Colorless Blender. For his hat I was going for a sueded cotton like some of the nicer hats are...so after shading I stippled it with my colorless blender to add the suede texture. Just a simple card to wish a little boy a happy birthday! Ah, this is adorable and I love how you used your colorless blender on his hat - gorgeous texture! what a wonderful card Michelle! I really love the extra texture you added to the hat. It really pulls my eye! The designer paper you selected is wonderful and coordinates so nicely with the theme!